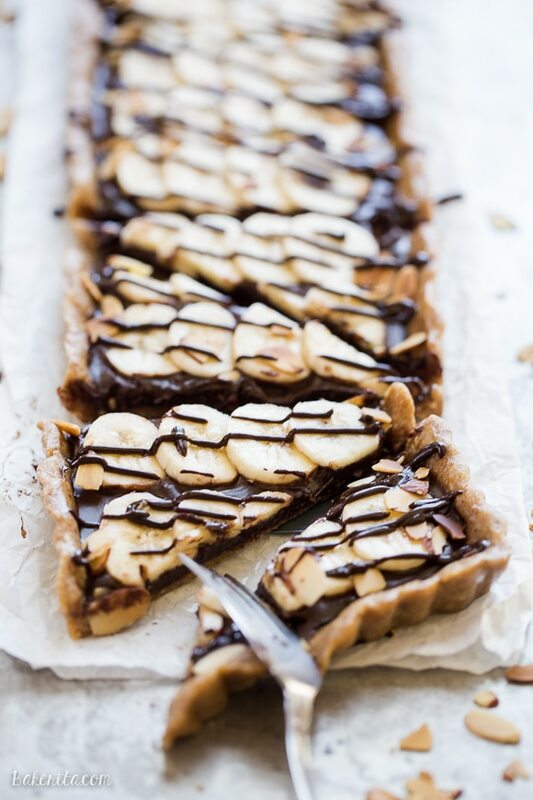 This No-Bake Chocolate Banana Tart has an easy date crust, filled with creamy chocolate ganache and sliced bananas! This quick and simple recipe is only has five ingredients and it’s gluten-free, Paleo and vegan. Sometimes, simple is the best. While I love to create recipes with tons of fabulous ingredients, that take a bit of standing time in the kitchen to create, there’s other times (like when I’m baking in this summer heat) that I want a recipe that’s the wham-bam-thank-you-ma’am kind of simple. And nothing says simple quite like a no-baking-required dessert made with just five ingredients, am I right? San Diego has been a pleasant 80-ish degrees this week, but I know so many of you are practically melting into puddles in the summer heat right now, and the thought of turning on an oven makes you melt even more. So, we’re skipping the oven today. In fact, we’re skipping any cooking at all, except for heating up some milk, which can totally be done in the microwave. For our no-bake crust? We’re using dates and almonds. I somehow think I have never posted a recipe using a date crust, though I’ve made them a few times over the years. Date crusts are so simple and delicious. They typically have a base of dates and nuts. I opted to use almonds, but you can definitely substitute in a different nut if you have something else on hand. The dates and nuts are combined in a food processor or high-powered blender until it comes together in a sticky dough. I over-blended my crust a bit, so it was more soft and chewy, but if you pulse until just combined with little bits of almond still remaining, you get a chewy crust with a bit of crunch that provides the perfect base to the tart. The filling is a simple chocolate ganache, made with dark chocolate and non-dairy milk. I used almond milk because it was in the fridge, but any kind of milk or cream would work here. Sliced bananas top the chocolate ganache, and for some crunch, I sprinkled toasted almonds on top of them. The whole shebang got drizzled with a bit more chocolate ganache. After a chill in the fridge to firm up the chocolate, it’s ready to devour! The whole thing takes maybe fifteen minutes to put together, and it’s so incredibly delicious – you’d never all that flavor came from only five ingredients. My family went to town on this one when they came over for Sunday dinner, and I could feel good about feeding them a treat that wasn’t so unhealthy. I hope this one makes it’s way into your kitchen too! Lightly grease a 14x5" rectangular tart pan or 9" tart pan with coconut oil. Set aside. Add the pitted dates and almonds to a food processor or high-powered blender and pulverize until it comes together into a "dough", with small almond bits remaining. Press the almond date dough evenly along the bottom and up the sides of the prepared pan. Place the chocolate chunks into a heat-proof bowl. Heat the non-dairy milk on the stove until just simmering, or in the microwave for about 30 seconds. Pour the milk over the chocolate, making sure all the chocolate is submerged, and let sit for a minute or two. Stir until smooth. Reserve a small amount of the melted chocolate to drizzle if desired, and then smooth the rest evenly over the crust. Arrange the banana slices over the chocolate, sprinkle almonds over the bananas, and drizzle the remaining chocolate over everything. Place in the refrigerator for at least an hour to set before serving. Wow, what an interesting crust Rachel! 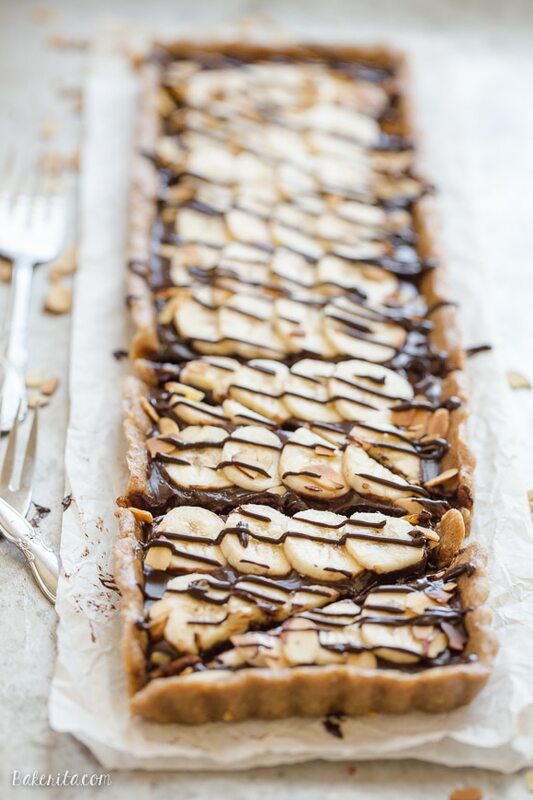 I can’t get enough of your chocolate peanut butter tart with the pretzel crust, so I’ll be adding this one to my summer dessert list too! Thanks for sharing! Chocolate + bananas sign me up . This looks wonderful, love the crust! Take care! Simple recipes really are the best! This tart is absolutely gorgeous, Rachel! I love the chocolate and banana combo. And I can’t get over how easy this is to make! Sounds like the perfect easy dessert! Oh my GOSH, Rachel!! Could your photography even BE any more gorgeous, girl?? 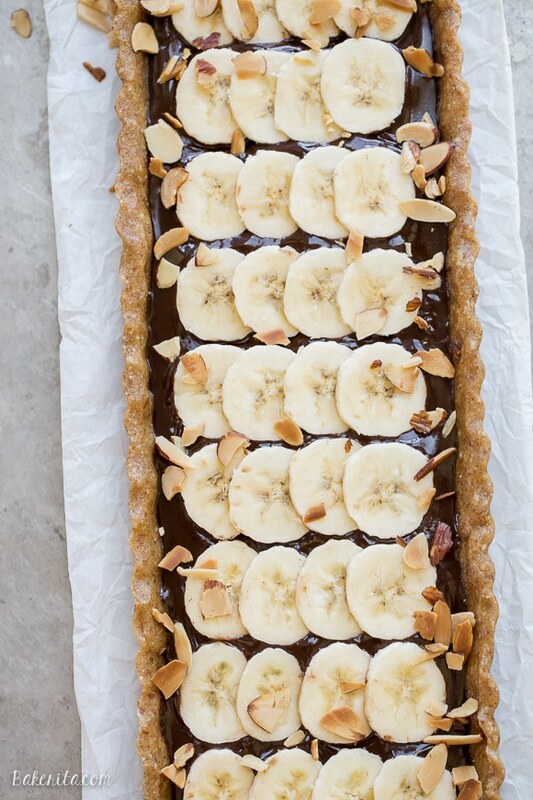 I’m obsessing over how pretty this tart is and seriously considering diving into my screen right now! And only 6 ingredients FOR REAL for this kinda goodness? Sign me up! That date and nut crust sounds irresistible. Using dates that way is sooo good! This looks so fancy. Definitely a showstopper! 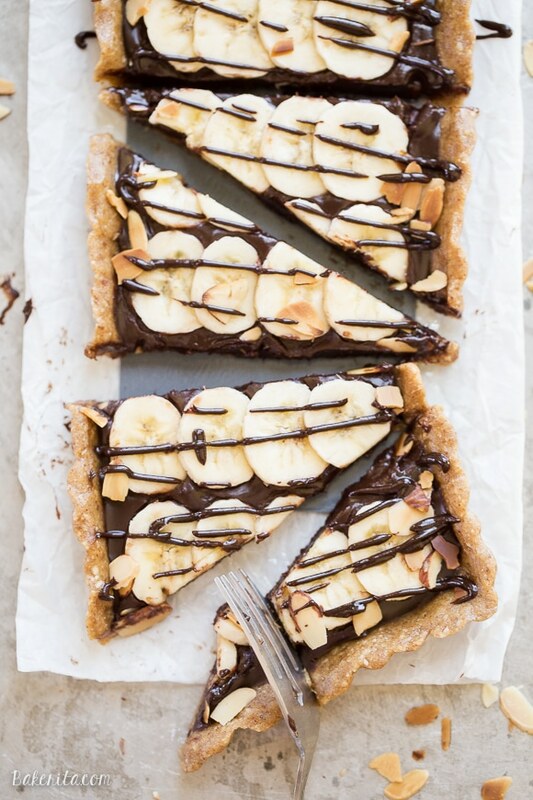 I’m serisouly amazed that you managed to make this delicious tart thats raw, gluten-free, vegan and paleo! Like how do you come up with these amazing creations? DROOLING! Beautiful!!! And I agree sometimes simple is just the best! Rachel, you totally blow me away with your simple allergy-friendly desserts! I think people think baking gluten and dairy free has to be so complicated but you show us otherwise. I’m keeping all of these on my to try list for the holidays! What a great summer dessert! Love the date crust! This looks so delicious!! I love the crust! How creative! MAYBE just MAYBE the man will like this one!!! Can you use Almond flour instead of almonds? Hi Tracy – the texture might be a bit different since the almonds do stay a little chunky in the crust, but it would probably work. I would only use about 1 cup of almond flour, instead of 1 1/2 cups. Let me know how it turns out if you try it! I made this yesterday, and it is a new summer favorite!! For whatever reason I had to add a lot more dates and even a few tbsps of coconut oil to get the ‘dough’ to start forming and it looked more grainy than your’s. I’m guessing that is an issue with my food processor. I only had Blue Diamond Almond Breeze almond and coconut milk mix on hand, and it was delicious in the ganache! I highly recommend the almond and coconut milk mix. I can’t wait to check out the rest of your blog!! Hi Jess, I used a Vitamix for the crust so mine got super blended pretty quickly, which definitely takes longer in a food processor. Glad you loved it though! This tart is absolute, utter, PERFECTION! so simple yet so amazing! Does the crust hold up well when you serve this? For instance if I pick up a slice with my hands like a cookie will it fall apart? Hi Nicole. The crust isn’t super hard and firm like a cookie crust, but it will hold up – it won’t crumble, but the crust might bend if you try to lift it with your hands. The tart will hold up best when cool. Hope this helps! Such a great recipe and I definitely have to try it! 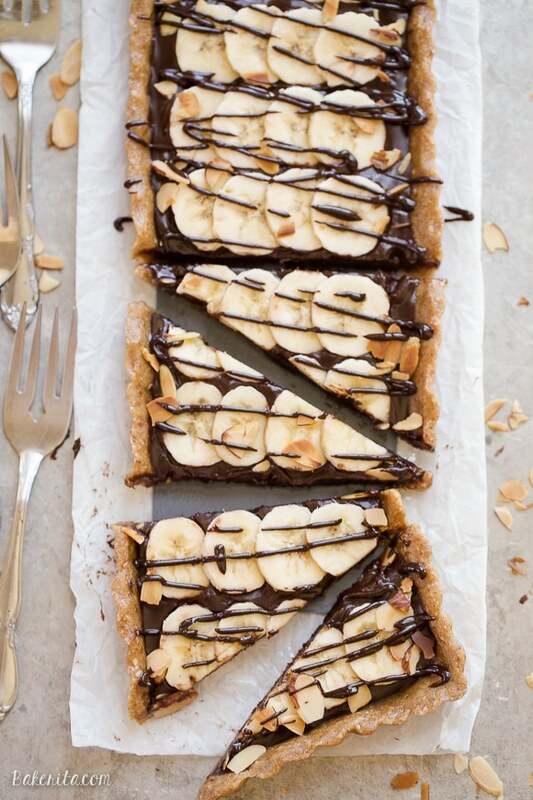 I’m passionate about vegan stuff and tarts and this looks amazing! Thank you for sharing. I’m a fan of anything with few ingredients and no need for baking. It helps a ton when it looks this good too! Winning! If I use dairy free chocolate will it make the recipe dairy free too? Or is there anything else in here that has dairy? I’m planning to make this for my grandmother in law who is gluten free and dairy free. Hi Nancy, no, since the recipe is vegan, there is no dairy in the recipe. 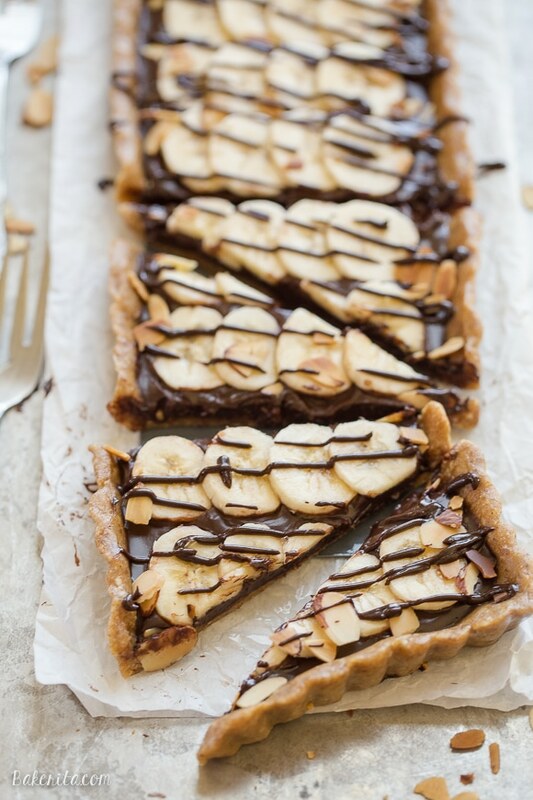 Just wondering how well the banana slices last if the whole tart doesn’t get eaten straight away? I was planning on serving this as part of our Christmas dinner, but we will have more than one dessert served so I don’t want it to go to waste! Hi Vanessa, the bananas have lasted just fine for me for about a day or two! Definitely better the sooner you eat it (like most fruit desserts) but definitely not gross or inedible the next day.